Organize with efficiency using Removable Note Dots. 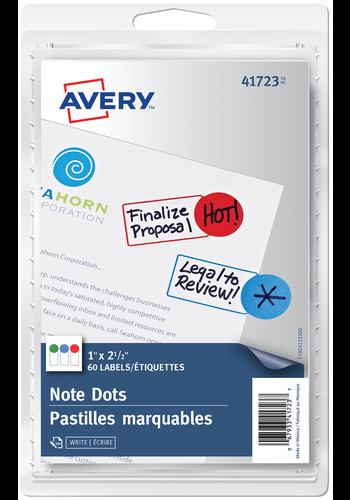 These nifty little dots help you highlight important information, plus give you extra room to write quick notes. Stick them to documents, calendars, reports, ledger sheets and more. Organize with efficiency using Removable Note Dots. These nifty little dots help you highlight important information, plus give you extra room to write quick notes. Stick them to documents, calendars, reports, ledger sheets and more. The labels are removable so you can easily peel them away when they're no longer needed. Great for marking important info at work, school or to-do-lists at home. Note Dots give you an effective and colourful way to get organized. Label Size 1" x 2½"